Robert De Niro gives the performance of his career as "Bronx Bull" Jake La Motta, a boxer whose psychological and sexual complexities erupt into violence both in and out of the ring. Joe Pesci and Cathy Moriarty are compelling as the brother who falls prey to Jake's mounting paranoia and jealousy, and the fifteen-year-old girl who becomes his most prized trophy. When I screened the DVD of 1980's Raging Bull, I hadn't seen it in a while. Though I always thought it was good, I never quite agreed with the tremendous critical hype that currently accompanies it. Critics now proclaim it as the best flick of the Eighties, but I think that’s a radical overstatement. Since it'd been a few years, I was interested to see if I’d still view Bull as overrated. Now that I've watched it again, I can’t say that my thoughts have changed. While Raging Bull is clearly a very well made and effective film, it still really doesn't do much for me. Raging Bull resembles Taxi Driver - another flick from director Martin Scorsese - in that both films basically offer character studies. Neither had much of a plot because that wasn't the point. Instead, they focused on giving us a living portrait of individuals. However, Travis Bickle in Taxi Driver provided a much more interesting study. Bull’s Jake La Motta (Robert De Niro) simply doesn’t display the same level of intrigue. As he does in Taxi Driver, Scorsese does not offer any attempt at historical context for La Motta. By that I mean that we see both La Motta and Bickle as fully formed - and pretty screwed up - men; we don't receive any information about how they came to be who they are. Bickle's more obviously mentally debilitated than La Motta, but this doesn't mean that Jake's not pretty bad off as well. He spends the entire movie trying to decide who he hates the most: himself or everyone else. Bickle is a study in self-hatred as well, and both men frequently project their negativity outward by seeing the world as a filthy, horrible place. The main difference is that Bickle's world really was pretty seedy, whereas La Motta is more of a tragic figure; he literally had it all but he blew it because he couldn't cope with the demons that haunted him. De Niro does an excellent job of fully portraying La Motta. At this point, much of his recognition for the part comes from his willingness to gain or shed weight for it. It's like the time that Nicolas Cage actually ate a cockroach for the flick Vampire’s Kiss. People focus so much on the physical elements that they ignore the rest of the performance. Unfortunately, that notoriety overshadows what is a masterful, full-blooded portrait of a man in constant pain. Admittedly, we rarely get much insight into Jake's thought processes. However, that's really how it should be since it doesn't appear that La Motta was much of a thinker. I doubt he spent a whole lot of time exploring his "inner self”, and that extreme lack of self-awareness comes through clearly in De Niro's performance. Jake doesn't act, he reacts, and he torments himself for the consequences later, such as in the scene where he beats his bare fists against a concrete wall and repeatedly cries "Why?!" La Motta obviously doesn't want to behave the way he does, but he lacks the simplest concept of how to change, so by the end of the film, he's left as a faded shadow of himself. In addition to De Niro, Joe Pesci and Cathy Moriarty round out the main cast as Jake's brother Joey and wife Vickie, respectively. Both are very solid but overshadowed by De Niro, something that was probably inevitable. Both characters suffer through most of the flick, although both also abandon Jake when his abuse gets to be too much. Joey's a somewhat more believable character just because he has lifelong ties to Jake; it makes more sense for him to continue to take the abuse for such a long time. Obviously, many women stay in destructive relationships as well, but it's harder to understand why Vickie stays as long as she does because we never see much indication about what enticed her into the relationship in the first place. There's very little depiction of the "good times" so we never really understand why she got involved with Jake at all. I also had a hard time believing Moriarty as a 15 year old, but that's just because I don't think ever looked younger than 30; she was only 19 when the movie was shot, but she appears at least a decade older. She must've popped from the womb full-formed! In the end, Raging Bull is more a movie that I respect than one I enjoy. This has nothing to do with the fact that it's somber and a "downer"; I love plenty of films that not only don't end happily, but also offer virtually no joy along the way. No, there's just something about Raging Bull that turns me off. It's a tremendously well-constructed and executed picture, but it lacks a certain spark that might otherwise involve me in the story. 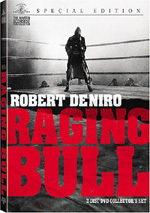 Raging Bull appears in an aspect ratio of approximately 1.85:1 on this single-sided, double-layered DVD; the widescreen image has been enhanced for 16X9 televisions. A transfer with few flaws, it presented the film well. Almost no concerns connected to definition occurred. A few wide shots demonstrated a little softness, but that was it. The rest of the time the movie looked quite distinctive and crisp. I saw no issues with jagged edges or moiré effects, and only a smidgen of edge enhancement appeared. Print flaws stayed very minor. A few specks cropped up, but they were infrequent and generally not intrusive. The grain that manifested itself stemmed from the original photography and wasn’t a negative. Contrast was strong, with solid distinction in the black and white tones. The dark elements were firm and rich, while shadows seemed clear and well-defined. Overall, the image offered a strong transfer that just barely fell below “A”-level standards. As for the Dolby Digital 5.1 soundtrack of Raging Bull, it gave us a restrained affair. The soundfield stayed oriented toward the front and usually emphasized general ambience. Various elements from the environment popped up on the sides; for example, when Jake would get violent with a loved one, we might hear him break items in the right or left speakers. A little moderately directional dialogue occurred as well, though those examples weren’t terribly clear. The music didn’t present great separation, but it spread acceptably across the front. Surrounds usage was generally limited to the fights. Those featured the crowds in the back speakers as well as the dramatic slowed-down sounds that accentuated the animalism of La Motta’s battles. The soundfield didn’t present a lot of information, but honestly, that was probably a good thing. Frankly, I’d have preferred a mono mix, as that would match the movie’s period feeling. Audio quality was good. Speech occasionally suffered from a little edginess, but the lines usually sounded acceptably concise and clear. Effects were also tight and reasonably accurate, with a bit of low-end for some of the dramatically accentuated fight sounds. Music stayed in the background and didn’t play much of a role, but the score was fairly smooth. There wasn’t a whole lot to the mix, and that meant I felt it merited a “B” as a fine but unexceptional piece from 1980. When I compared the quality of this new special edition to the original DVD, I found that the new one marked definite improvements. The 5.1 track improved over the original Dolby Surround mix largely due to better localization. The old audio suffered from some annoying bleeding that spread audio to the surrounds when it shouldn’t have been there. The 5.1 edition also demonstrated slightly stronger fidelity, though this wasn’t an enormous improvement. The picture benefits from the added sharpness that comes with an anamorphic transfer; the original wasn’t 16X9, so it seemed fuzzier in general. The new image also presents fewer source flaws and looks notably cleaner. Across the board, this is a superior picture. Another substantial change came from the roster of extras on the special edition release. Whereas the original version came with only a trailer, this one adds lots of materials. On DVD One, we start with three separate audio commentaries. The first features director Martin Scorsese and editor Thelma Schoonmaker, both of whom provided separate running, screen-specific tracks that were edited together. The pair covers a wide mix of topics. We learn about Scorsese’s initial interest in the project and its development as well as a little about Schoonmaker’s early career. In addition, we get notes about casting, locations and shooting challenges, editing and problems encountered during improvised sequences, musical choices, the movie’s visual style and use of slow-motion, the decision to go with black and white, and other production issues. I can’t quibble with the material discussed, as both Scorsese and Schoonmaker help broaden our understanding of the film. My main problem with the commentary stems from the preponderance of dead air. Quite a few gaps occur, and these make the track move slowly much of the time. It’s still a generally interesting piece, but it’s not a great one. For the second commentary, we hear from producers Irwin Winkler and Robert Chartoff, director of photography Michael Chapman, casting director Cis Corman, sound designer Frank Warner, music supervisor Robbie Robertson and actors Theresa Saldana and John Turturro. All of them were recorded separately for this editing commentary. You can probably figure out what subjects they discuss based on their job descriptions. We get a nice overview of many different topics. The issues include casting and working with the actors, getting financial support for the film and nursing it to completion, the use of black and white photography and its challenges, other visual concerns, selecting and recording the music, and creating the audio. Unlike the Scorsese/Schoonmaker track, this one suffers from virtually no downtime. It cranks along from start to finish and gets into a mix of useful topics. A little material repeats from the earlier piece, but most of it’s fresh, and this becomes a lively and very informative chat. Lastly, the final commentary includes remarks from Jake La Motta and screenwriters Mardik Martin and Paul Schrader. As with the prior tracks, the various participants sat separately and had their notes edited together. For his portions, La Motta chats with his nephew, Jason Lustig. He doesn’t really participate as more than an interviewer, though, so I didn’t include him as a featured participant in the commentary. As one might expect, La Motta mostly focuses on the facts of his life. He discusses the various elements that show up in the movie and embellishes on many of these. La Motta most strongly comes to life when he talks about his fights; he seems more evasive when he gets into parts of his personal life, though he still opens up with some of those tales. Actually, he enters “too much information” territory at times; when he talks about pounding his fists and head against the wall, he says it turned him on and made him orgasmic. I’m not sure if he’s joking, but it’s a creepy thought anyway. La Motta even performs the monologue from On the Waterfront along with De Niro at the movie’s end! The writers deal more with how they created the script. We get notes about Martin’s initial work and the refinement Schrader did. We find a lot more from Martin than from Schrader, as the latter pops up pretty infrequently. Both men present useful comments, though. I especially like Martin’s discussion of improvisation and the loose way some folks throw around the term. Overall, all three parties involved with the commentary help make it consistently involving and informative. As we head to DVD Two, we start with a collection of featurettes. The 26-minute Before the Fight comes first and presents movie clips, archival materials, and interviews. We hear from Chartoff, Winkler, Scorsese, Martin, Schrader, and actors Robert De Niro, Cathy Moriarty-Gentile, Frank Vincent and Joe Pesci. They discuss the roots of the project and De Niro’s interest in it, the development of Bull and Scorsese’s reluctance to take on the flick, writing the screenplay and research, revisions to the script, obtaining financing and dealing with the studio, and casting and approaches to the roles. Inevitably, “Before” repeats a moderate amount of information from the commentaries. Since those tracks covered more than six hours, this doesn’t come as a surprise. We do find a reasonable amount of new material here, at least, as we learn various perspectives and thoughts that don’t pop up elsewhere. The addition of the actors helps evoke concepts not apparent previously. “Before” provides a nice take on the issues related to the film’s pre-production. For the next clip, we get the 14-minute and 46-second Inside the Ring. 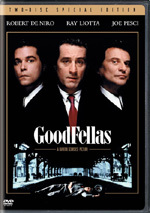 It includes remarks from Scorsese, Pesci, Chapman, Schoonmaker, and De Niro. This program looks into the depiction of the boxing sequences. It goes into Scorsese’s research, the decision to shoot in black and white, fight choreography and storyboards, shooting the boxing matches, and attempts at verisimilitude in these sequences. Again, a fair amount of repeated material pops up during “Inside”, so don’t expect a slew of revelations. However, the addition of various visuals helps make this a good program. I like the ability to see elements like storyboards and behind the scenes shots, as those allow us to better comprehend the various techniques. Schoonmaker’s discussion of the different styles for the fights works especially well, largely because the use of visuals breaks down the sequences for us better than in the commentaries. Called Outside the Ring, the third featurette runs 27 minutes and 24 seconds as it features statements from Scorsese, Winkler, Pesci, Schoonmaker, De Niro, Moriarty-Gentile, Chapman, Vincent, and Chartoff. It covers shooting the non-boxing sequences, improvisation, symbolism, the home movies, De Niro’s weight gain, the film’s structure, and the film’s dedication. “Outside” doesn’t offer a whole lot of new information. It creates a good look at its subject, but not one that offers a lot of revelations if you’ve listened to the commentaries. Nonetheless, a few useful perspectives appear, and it delivers an interesting compilation of notes. Next comes After the Fight, a 15-minute and 23-second program. In it, we hear from Scorsese, Schoonmaker, Pesci, De Niro, Warner, Winkler and Chartoff. The show gets into sound design, music and mixing, reviews and reactions to the final flick, and general thoughts about its place in the participants’ careers. As with its predecessors, “After” proves entertaining but not especially informative if you’ve heard the commentaries. It goes over the same material in an abbreviated manner. Of the different featurettes, it probably includes the least amount of unique material, though it remains well-constructed. A documentary entitled The Bronx Bull fills 27 minutes and 54 seconds. It presents notes from La Motta, Schoonmaker, and film critics Ian Nathan, Derek Malcom, Ben Ollins, and Andrew Fulver. “Bull” alternates between comments from La Motta about his life and involvement with the flick and others’ reflections on the movie. Schoonmaker delves into some elements of making the flick, though she doesn’t tell us much we don’t already know. Ultimately, that’s a problem, as “Bull” feels doubly redundant after the commentaries and prior documentaries. For an interesting comparison, we head to De Niro vs. La Motta. This three-minute and 48-second piece cuts from movie shots to newsreel footage and photos of La Motta. The best parts compare actual fights to the staged bouts. It’s awfully short, but it’s an intriguing glimpse of fact vs. fiction. We also get some additional newsreel footage. La Motta Defends Title runs 61 seconds and shows the fight clips from the last piece without the cuts to movie material. Again, I’d have liked more of this, but “Title” presents a decent snippet. In addition to the trailer for Bull, some ads appear in the Other Great MGM Releases area. 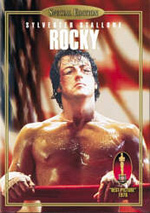 This presents a clip for Rocky plus general promos for MGM’s Oscar winners and “MGM Means Great Movies”. Finally, the set includes a 16-page booklet. In addition to a few photos, it presents production notes that cover issues like the project’s genesis, casting, De Niro’s weight gain, makeup and the fight sequences, and awards. Of course, we already know a lot of this, but a fair amount of new info appears, at least in regard to some details that don’t appear elsewhere. The booklet presents a nice complement to the set. As a film, Raging Bull remains an admirable enigma to me. I respect the movie and like parts of it, but I’ve never been able to truly embrace it. Still, it’s a very well-made affair that deserves special attention for Robert De Niro’s terrific performance. The DVD itself provides consistently satisfying picture and audio plus a fine roster of extras highlighted by three positive commentaries. Despite my lack of real affection for Raging Bull, I recognize its strengths and recommend it. Should folks who own the prior DVD upgrade to this new one? Definitely. Not only does it improve on the original’s picture and sound, but also it adds a terrific collection of supplements. The new Raging Bull is a stellar release that finally does justice to the classic film.